Traveling by bus may not be the fastest way to go from Laos to Thailand, but it sure is one of the cheapest. So if your goal is to save money by going overland, you came to the right place: we’ve compiled the information you’ll need to do so. In Luang Prabang vouchers for the Bus tickets can be bought in advance at the travel agencies located on Sisavagnon street. Prices will vary slightly from agency to agency, so is up to you to look for the best offer. Even though we bought tickets for a sleeping bus, we ended up traveling on a bus with reclining seats — probably due to the small number of people traveling that day. Nonetheless, everyone got a blanket, and the spacious seats were comfortable enough to sleep in. It was a surprisingly tolerable 17-hour trip. 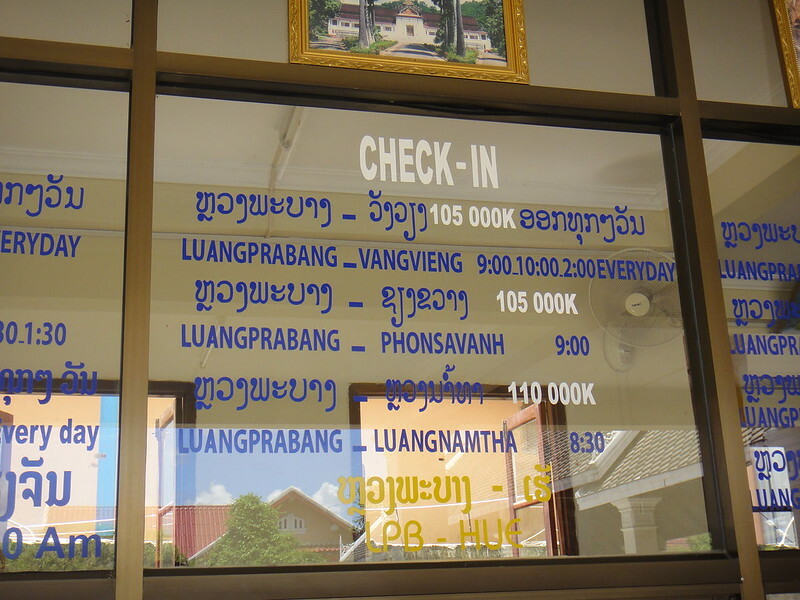 On the day of departure, you must be at the Luang Prabang Bus Station counter by 5:30 PM to check-in, and exchange your voucher for the final bus ticket. Tuk-tuks to the bus station cost around 15,000 Kip (€1.50) per person. At the start of the trip, all passengers got a complimentary water bottle, a small soy milk box, and snacks. We had 2 bathroom breaks during the night, and 1 more early in the morning. On the latest, we stopped at a service station with food stalls and a large clean washroom. This first leg of the trip took around 14 hours (from Luang Prabang to the Huay Xai border post). Being Saturday morning, we had to pay a weekend fee of 10.000 Kips (€1.00) to get our passport exit stamp. The bus waited on the other side of the border. From there, it takes 3 more hours to get to Chiang Rai. Remember to check beforehand your entry requirements for Thailand: Visas and border crossings. We arrived at Chiang Rai Bus Terminal 2 at 11:00 A.M.
Here’s where all long-distance buses stop, unfortunately, it’s also the furthest bus station from the city center. From here you can hop on a songthaew and head to town. 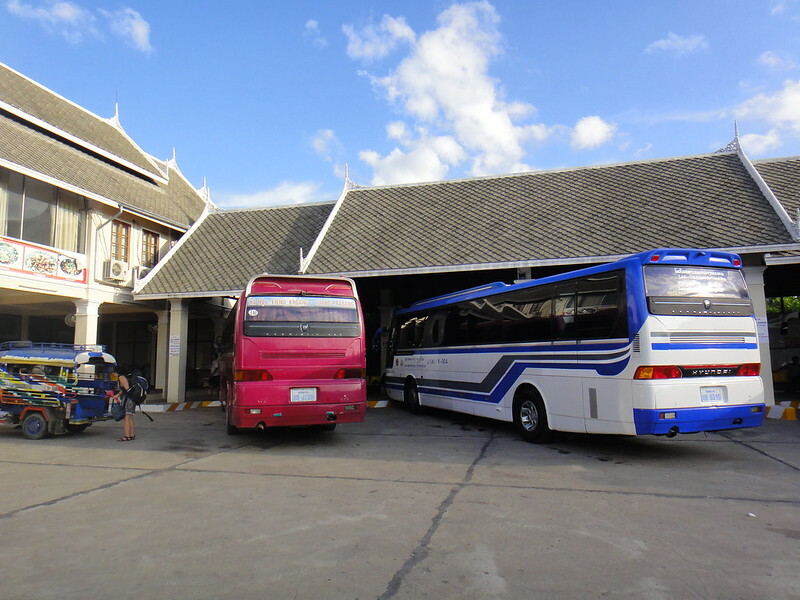 Share the fare with other people from your bus as many will be going to Chiang Rai too. We paid €0.50 each for a ride to the city center.